This afternoon I spent an hour hanging out with legendary French electronic music pioner Jean-Michel Jarre, and together we watched an amazing never seen before and impossible to do in real life VJ set with other fan girls and boys. 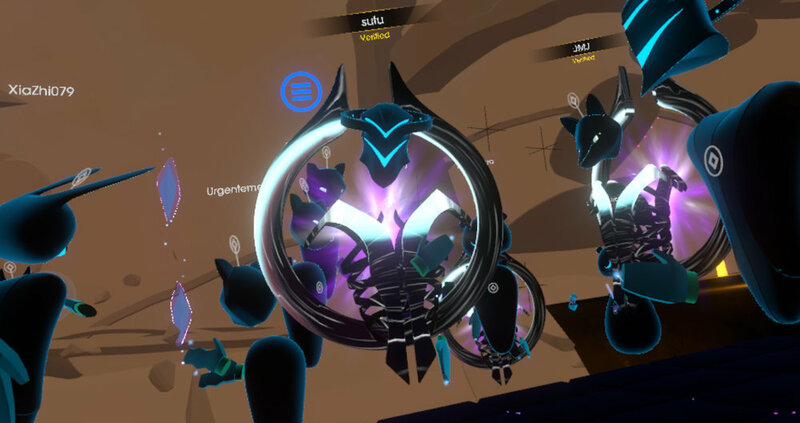 It was a social VR experience in TheWaveVR and the DJ and VJ was Sutu Eats Flies, famous in his own right for his gigs on this emerging social music VR platform. You would think there would have been hundreds, if not thosuands of fans of Jarre’s music attending such an event that enabled anyone to walk up to the legend, to become virtually friend with him and to casually converse, but the instance I was in contained merely a couple of dozen of people. Just a few days earlier in Sansar, another social VR platform, I had woken up at 4 am to catch a virtual comedy show titled Comedy Gladiators, in which comedian and YouTube sensation Steve Hofstetter brought friends and fellow comedians Maz Jobrani, Ben Gleib, Alonzo Bodden, and Mary-Lynn Rajskub into VR. There were more people at the comedy show than at the concert but not by a long stretch. While I don’t know how many instances of either shows that were running in parallel, it is obvious that whatever people are using their VR headsets for these days it is mostly not involving social VR. Sansar’s virtual comedy event was fun but a low key affair. 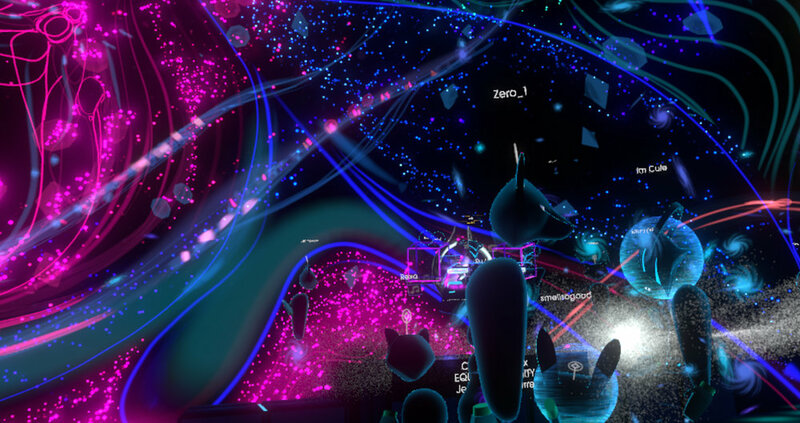 With both Sansar and VRchat recently available on Steam, the latter being the by far largest platform for social VR, figures are emerging that show just how few people are in a social VR at a given moment. While Steam is not the only distribution platform for VR, there is Oculus of course and several of the apps can be launched outside of Steam and Oculus, the numbers are quite telling. On Steam this past Sunday 9 people were seen in High Fidelity, 12 in Altspace VR, 62 in Sansar, 79 in Bigscreen (Beta), 340 in RecRoom, and 8098 in VRchat. Research has shown that people being given superpowers in social VR, such as the power to fly and then are enticed to help other users by flying and rescuing them are coming out of the experience being more empathic and helpful in real reality. New startups like Norwegian Dimension 10 give people the superpower to cut through complex 3d models of offshore constructions and buildings alike and to virtually meet with other team members crossing physical distances in seconds to save companies lots of money and time. And social VR experiences like TheWaveVR and Sansar let you hang out and talk with superstars without the need to pay for stellar prized VIP passes or fly across oceans to concerts. Ask most any one who is working in virtual reality where the future is for VR and most will say that while it is hard to speculate and give a definitive answer it will most certainly involve some kind of social VR. So why aren’t people flocking to these experiences then? The first problem is that VR gear is still rather expensive and the power of VR and of social VR in particular can’t be understood unless it is experienced first hand. The problem with that is that there aren’t many places one can experience it in public and most people doesn’t happen to have a friend or colleague with VR gear nearby. The second problem is that we have become accustomed to asynchronous communication via platforms like Facebook, Twitter and SMS being the de facto way of communicating long distance and media-on-demand is how most people fit entertainment into their increasingly busy life. Meeting up virtually at specific days and times it seems requires too much of an effort. DJVJ Sutu Eats Flies and legendary electronic music pioneer Jean-Michel Jarre (JMJ) hang out with fans after the amazing set. One of the strategies that several of the social VR experiences are using to attract more users is allowing traditional first-person navigation on a 2D computer screen where the only requirement is having a gaming PC. This enabled more than 20 000 concurrent users in VRchat at the height of the “Uganda Knuckles” memes craze brought to the public eye by YouTube streamers one year ago. Almost all of those users has left the platform by now and while many were envious of VR players that could move their bodies much more realistically they never experienced the true power of the platform - feeling like you truly was somewhere else together with other people, or telepresence which is really the unique selling point of VR. While we are waiting for less expensive and more accessible VR gear to come to market such as perhaps Oculus Quest (spring 2019), we are also waiting for a “triggering experience” or application to be developed I think. Something akin to SMS, or desktop publishing, or more simple like Word or Excel that everyone would want to use. In the mean time there are very exciting and some truly unique moments to be had in VR for those of us that are lucky enough to be working in and living in VR and for companies daring enough to seize the possibilities of virtual reality and give their customers and users superpowers.